When Tara Caimi was twenty-eight years old, she moved from Pennsylvania to Utah to support her boyfriend’s dog mushing dream. Nick was confident and courageous, outgoing and adventurous—everything Tara was not. Tara had always suffered from anxiety-related ailments, but in Utah her health steadily deteriorated. Living with Nick revealed some unexpected lifestyle differences, and the culture she encountered rendered her a perpetual outsider. The only comfort she found was in her surrogate family of sled dogs. As personal failures piled up amidst desperate feelings of isolation, her health declined to a point she could no longer ignore. 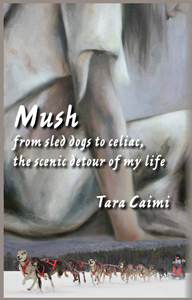 Mush is the story of Tara’s journey toward someone else’s dream and the lifesaving self-discovery it revealed. Libraries and book stores may order from Ingram. One of the things I admire most about Tara Caimi’s memoir Mush is what it is not. Mush follows Tara’s life as it slowly spins out of control and she’s sucked into a downward spiral of disappointment, stress, and physical illness that nearly kills her. But Tara is a survivor. She lives to write about the whole mess—with candor and with only the best intentions. Without bitterness, self-pity, and negativity. Mush is not another “poor-me” memoir. Tara Caimi’s Mush does not pretend. It’s an unsparing memoir, written with seductive honesty and few favours paid to the writer’s ego. Caimi’s story picks its way through the half-lit valleys of her wilderness years, as she follows a dream not her own. This is the sort of truth that plenty of us spend our lives avoiding, but she tackles it with a workmanlike lack of sentimentality. Caimi is a likeable and refreshing narrator whose prose allows the reader space to reflect. Adventure does not come easily to us all, as we learn on Tara Caimi’s journey to mountainous Mormon country. Caimi, following her boyfriend to Utah to support his dreams of owning a dog mushing operation, learns about her own strengths and anxieties while taking up residence in a forest, then a hut, and then a trailer house with a sinking floor and two stray cats. We are offered glimpses into the niche world of dog sledding as we watch Tara take her place as the compassionate yin to the disciplined yang of her boyfriend, and learn that sometimes appreciation of a dream doesn’t always require participation. An engaging and honest read. You’re going to want to tag along on this transformative trail that is Tara’s life. Sometimes she’s the musher, sometimes she’s not—but she ended up right where she needed to be: at a desk to capture an adventure that’s often as rough as the Utah terrain, yet, at other times, sparkly and smooth as a twilight sled ride. Tara’s debut memoir bubbles with beautiful language that captures the breathtaking mountainous desert scenery that surrounds her, and her writing is just as vivid when she describes what’s happening on the inside—from her head to her heart to her gut. This Tara-in-Transition is nothing short of courageous, but she also is never afraid to show her vulnerabilities, and never hesitates to stop, even just for a moment, to revel in childlike wonder as she’s introduced to new places, new people and new customs. Her words—her memories—bring these settings, these characters to life. Herself included. Mush is a heartfelt story of dogs, dirt roads and dreams—of health, hope and home.